Dr. Denese Skin Science HydroShield Ultra Moisturizing Face Serum Review 2018: Ingredients, Side Effects, Detailed Review And More. What is Hydroshield Moisturizing Serum? It helps replenish the moisture lost to your skin. It promotes a dewier, plumper and fuller skin that makes it look healthier and younger. It softens and fades dry lines, fine lines and wrinkles. This serum also protects your skin from showing even more visible signs of skin aging. It helps restore your brighter and youthful looking skin with regular use. Hydroshield Moisturizing Serum – Does it Really Work? This product works by combining moisture and skin conditioning ingredients to smoothen your skin and hydrate it from within. It also delivers wrinkle-correcting ingredients, such as retinol, which helps speed up the rate of skin healing and repair. Dimethicone: It acts as a skin conditioner. Glycine Soja (Soybean) Seed Extract: This ingredient helps relieve multiple skin inflammation. Ceramide II: It strengthens your skin’s protective barrier function. Retinol: Derived from Vitamin A, it helps regenerate and turnover your skin faster while also delivering skin lightening effect on dark areas of your skin. Tocopherol: Also Vitamin E, it soothes your skin and delivers added moisture. It also protects your skin from dryness and free radical damage. Linoleic and Linolenic Acids: It floods your skin with moisture and speeds up skin repairs. Ethylhexyl Cocoate: A strong emollient, this ingredient helps boost your skin’s moisture content. Lecithin: Supports the restoration of your skin’s ideal moisture levels while also helping trap in moisture to last longer. Glycolipids: These components help rebuild your skin’s protective barrier function. This product must only be used after cleansing your skin thoroughly. Apply about 2 pumps and spread evenly on face, neck and chest. Allow the product a few minutes to become fully absorbed by your skin before layering with thicker creams in your regimen. Based on a scientific evaluation, this product increased skin hydration levels by as much as 184% just 15 minutes after product application. This product has been formulated with drier to normal skin types. This product combines the benefits of hydrating, moisturizing, and conditioning all at the same time. This product is packaged in an opaque container which helps preserve the integrity and potency of its ingredients. This product is conveniently available for online purchase. The first ingredient that shows up on this product’s label is dimethicone, a silicone-based ingredient that may clog pores and cause skin infections. This product, because of its high silicone content, may not be suitable for use of people with acne-challenged skin. This product is relatively expensive compared with other products that are designed to benefit your skin in the same way. This serum will have a thicker consistency than water-based serums and may not be ideal for oilier skin types or, for more humid weather. This product is relatively more expensive compared to other similarly formulated products that commit to deliver the same skin goals. Does Hydroshield Moisturizing Serum Have Any Side-Effects? The Hydroshield Moisturizing Serum works to rehydrate your skin by delivering more hydrating ingredients while also protecting your skin’s barrier layer to prevent moisture from escaping into thin air. Product price is on the higher end of the spectrum though so it may not be as easy to maintain use as part of your daily regimen so your should consider price as well. Most of all, weigh this against other products first before buying. 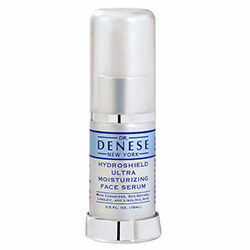 What is the Price of Hydroshield Moisturizing Serum? One 2 oz. bottle of this product costs $125. Where to buy Hydroshield Moisturizing Serum? This product is available on the official brand site and also on major retailer and reseller websites. Does the Hydroshield Moisturizing Serum come with money back guarantee? There is no information available on the brand website about this particular coverage. Is Hydroshield Moisturizing Serum approved by the FDA? Products like this do not require FDA approval. Who Should Use Hydroshield Moisturizing Serum? This serum is for everybody who wants to keep their skin well moisturized. Should I use the Hydroshield Moisturizing Serum once or twice daily? This product is intended for twice daily application. How long does one bottle of Hydroshield Moisturizing Serum last? A bottle should last for up to 30 days. How long will results last? Results last only so long as you are using this product. Can I use the Hydroshield Moisturizing Serum with makeup? Yes, although matte makeup will have to be considered as the high dimethicone content may make your cosmetics slip. The cosmetic industry currently offers a variety of wrinkle creams from a number of brands. To make the process of selecting a wrinkle cream as simple as possible, we've evaluated each cream on its ability to fulfill our requirements for a quality wrinkle cream. To be specific, we believe that a wrinkle cream should include ingredients that offer antioxidant protection for skin, in order to delay the onset of noticeable aging. At the same time, wrinkle creams should be able to renew skin, typically by containing compounds with collagen-stimulating properties. Additionally, such a cream should improve both the texture and appearance of skin by offering both long term anti-wrinkle benefits and hydrating agents to create smooth, firm skin. Listed below are our top wrinkle creams, according to these important characteristics. Be sure to get adequate rest every day.